Game night! This was January's third Tuesday Fignt night. A huge storm came down on central Florida, so we got a late start but managed to work a game to the fifth turn and the game was basically over anyway. This night I was helping a new player get a practice game in. This is the reason I slapped the LRC together last night, one of the possible lists had it. Our new player is Freddy, and he will be starting a Deamonhunters army with the new codex drop, so we took a thousand points out of the old codex to practice with. The match was Capture and Control/Spearhead. Keep reading for the game synopsis from my horrible memory. 1 Squad of Kasrkin with meltas, this-a-gun, that-a-gun, and all kinds of goodies. 1 Squad with a voxcaster/banner etc. 1 Command squad with the Company CO, Master of Ordnance, and a few cannon fodder jokers. 1 full squad on a ridge on the far end of his deployment. Mike deployed his command, Kasrkin, and regular squads near his objective, behind a few los blocking ruins on the far left edge of his deployment in cover, and his three chimeras in the middle with a clear line to the opposite corner of the board. Freddy placed his close assault unit with incinerators behind los to hook around hugging cover to attack Mike's objective. His support dread was behind waist high cover in a perfect firing position, his midfield dread was in center granting cover for his midrange psycannon squad directly across from the chimera line. The first turn was a lot of positioning of Mike's forces with some ineffective shooting, on both sides. -Mike got first turn and ran up his chimeras in an AV12 wall. -Multilaser fire was either out of range or ineffectual. -The orbital bombardment scattered off the mark with no LOS. Freddy failed to do any damage on the three chimeras with poor rolls from his dreads. Turn two had better shooting...on both sides. -The orbital bombardment scattered a bit but was able to vaporize a fire support GK who was slow to react. 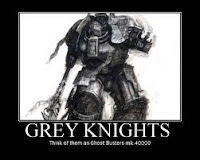 -We forgot shrouding, so Multilaser, heavy stubber, and heavy bolter fire sliced down PGK like wheat, leaving only three left standing, the two Psycannons and the Justicar. -The dreadnoughts got a little bit better...not much. A chimera in the center was immobilized, and a few more shots glanced wiht no effect. Question 2 Noble readers: If a hit glances, and the roll on the table is 1 or two, the roll would be modified -2 by the fact its a glance. does anything happen? There is no mention of that scenario in the BGB, so we assumed nothing happened, and did a dice roll to confirm it. How do you play it? -Multilasers and guard squads with First Rank, Second Rank, poured into the Terminators only managing to overwhelm one sending him to back the open arms of the Emperor. -Dreadnoughts got slightly better, with the lascannon dread Wrecking the rightmost chimera. -Again, a plasma blast glanced off a chimera with a 1 roll on the damage table. -Psycannon and stormbolter barked with no real effect, one or two unlucky guardsmen fell to the barrage. -Orbital bombardments were again ineffectual. -The chimeras and guard squads fired into the terminators killing three with the torrent. -A second Chimera was wrecked, by Lascannon. -With the Chimera advance effectively halted, the Plasma Cannon turned toward the Command squad killing three and with that, the Master of Ordinance. -With the assault squad in position, the Incinerators immolated the guard squad in front of the objective, Command squad and Kasrkin. -The Kasrkin took two wounds. The Company Commander squared off with the Brother Captain and remaining bodyguard. The Knights easily dispatched the remaining command squad troopers. The company commander, with blood on his lips and vengance on his tongue howled out and hit home with his PowerFist. Destined for the Brother Captain, the power fist instead struck home on the Terminator who's armor fell just short of absorbing the killing power of the blow. A noble sacrificial roar came out of the doomed Terminator as he fell. And with that final melee, the Knights collapsed to the objectives and ended up owning one, contesting the other. Arg...LOL So there we go. Three players all missed it looking right at BGB. Another thing to chalk up to the heat of battle. Thing a Day 1/26 Organization party! Thing a Day 1/24 CRUSADER! Thing a Day 1/21 COMPLETED METAL! Thing a Day 1/20 METAL! Thing a Day 1/17 Paint it Black, Part 1.